It’s ironic to realise that this offensive will be known to History under the name of the General who least approved it. In spite of his reservations, Marshal von Rundstedt was called back from retirement by Hitler because he had the soldiers trust. 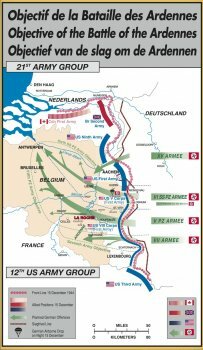 The plan was to push through the Ardennes, cross the River Meuse, re-take the port of Antwerp to prevent the arrival of allied supplies and reinforcements. Cut off and isolate the British Army from the Americans to force them into signing a separate truce. The German army of the western front could then be moved back to the east to face the Russians. However, the success of the offensive would depend on various important factors: speed in reaching the Meuse before the allies could reorganise, taking allied petrol dumps intact, taking control of important crossroads and widening the arrowhead to permit the advance on Antwerp. Most of all they needed low cloud cover to impede the actions of the allied air force. The German command decided that the main effort would be made by the 6th Armoured Army commanded by Sepp Dietrich who would attack through the Losheim Gap, cross the Elsenborn ridge and cross the Meuse between Liege and Huy. 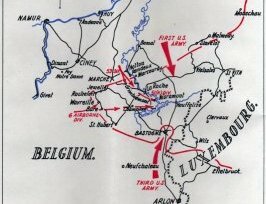 In the centre, von Manteufel’s 5th Army was to cross the Schnee Eifel, take St Vith and Bastogne and cross the Meuse between Namur and Dinant. The flanks of the attack were covered in the North by von Zangen’s 15th Army and in the South by Brandenberger’s 7th Army. Facing the 80.000 G.I.’s, 245 tanks and 590 canons, Marshal Model, commanding the Army Group B, was going to deploy 250.000 men, 600 tanks and 1.900 canons. THE GERMAN ATTACKS OF MAY ’40 and DECEMBER ’44 – similarities and differences. At first glance these two offensives could seem quite similar and one can wonder how the allies were caught a second time. 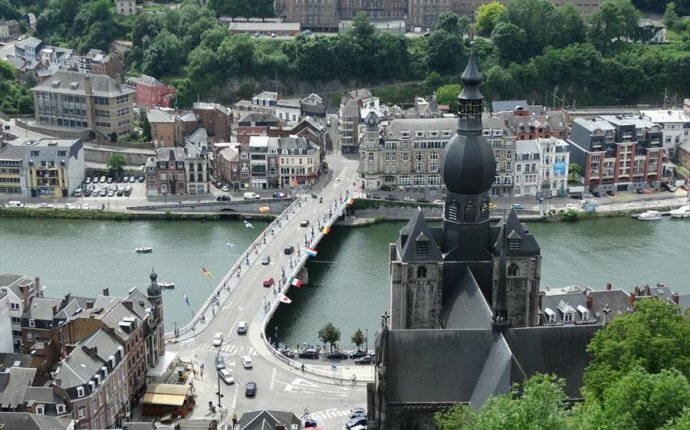 · In May ’40 the Germans reached the Meuse between Dinant and Sedan and turned up to the north-east to trap the British in Belgium. 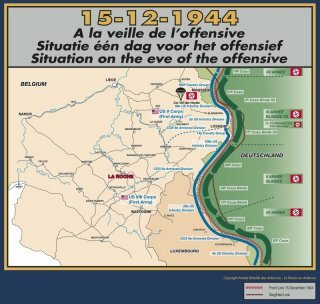 · In December ’44 the Germans tried to reach the Meuse between Namur and Liege to then go upwards along the Albert Canal towards Antwerp and trap a large section of the allied forces in Holland. 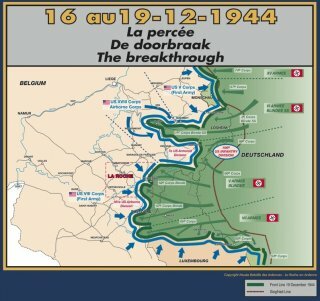 · In May ’40 the Belgians had only two divisions to oppose the invader and they were used in delaying actions only. Headquarters had in fact decided to form the defensive line behind the Meuse. The troops in the Ardennes were only there to delay the invader and give the French, British and Belgian armies the time to deploy along the Meuse. 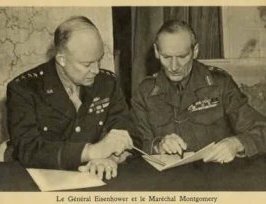 · In December ’44 this mistake was not repeated. The strong German offensive put the allies in the same position as in May ’40 of deciding whether to retreat behind the Meuse or hold the Ardennes ridges at all costs. The decided to resist along the last ridge of the Ardennes. · And finally the weather conditions were completely different in May’40 and December ’44. Attacking through the Ardennes in winter was a gamble and the Allied command did not think that Hitler would make it. The bad weather in Europe from the summer to the end of 1944 was to be used by the Germans during their ultimate offensive in the Ardennes. It’s based on the predictions of Werner Schwerdfeger, prophet of the meteorologists, that Hitler, who had total trust in him, decided the date and tactics of the first few days of the offensive in most awful weather conditions. Thick fog, cold, snow, black ice, rain and mud added to the Ardennes difficult terrain were certainly not in favour of a large scale offensive but certainly in favour of a surprise attack! Most important was the low ceiling with a cloud cover preventing the allied airforce from making observation sorties beyond the Siegfried Line and preventing attacks on the German troops when they launched the offensive. Hitler took full advantage of the surprise and weather conditions to push through the thin allied front line. Later, with the front line being pushed back and Bastogne encircled it became important to the allies to know how the weather would evolve. In Reims the 21st Weather Squadron at the HQ of the 9th Bombardier Division of Major-General Sam Anderson, was watching the weather. On December 22nd at around midnight Lieutenant Lloyd Vanderman seeing a very low humidity, a rapidly falling temperature and a rising atmospheric pressure, prepared a very favourable weather forecast justified by the eastward moving anticyclone. Using these long awaited signs, Anderson called up the 9th Airforce in Luxembourg and was given a few targets. He ordered his men to stand by and get the bombers ready for takeoff.